Angkor Wat topped the list as the No. 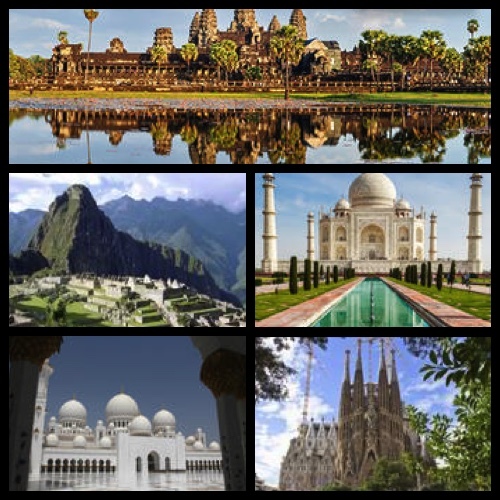 1 world landmark to visit in 2015. Angkor is one of Southeast Asia’s most important archaeological sites. Its vast temple complex is home to the world-famous ancient Temple of Angkor Wat, one of Cambodia’s most visited tourist destinations. Dating back to the 12th century, this magnificent temple complex features intricate wall carvings, majestic towers, a wide moat and stunning reflection pools. The temple looks striking any time of the day, but particularly so during sunrise. Peak season is from November to March. Coming in at No. 2 is Machu Picchu, the most famous archaeological site in South America – and Peru’s most visited attraction. Built in the 15th century, the massive Incan ruins are nestled within a dramatic tropical mountain landscape on the slopes of the Peruvian Andes. In 1983, Machu Picchu was named a Unesco World Heritage Site and in 2007, the famous ruins were designated one of the New Seven Wonders of the World. Expect crowds during peak season (late May-early September). It’s no surprise that the Taj Mahal is included on the list as the world’s third most must-see landmark attraction. It’s India’s most recognizable structure – and one of the most famous buildings on the planet. As one of the New Seven Wonders of the World, the Taj Mahal is visited by millions of people every year. Located in Agra, the stunning 17th century white marble mausoleum is an architectural masterpiece. Built by Emperor Shah Jahn to house the tomb of his beloved third wife, the Taj Mahal is one of the most photographed sites in the world. Who can forget that heart-wrenching picture of Princess Diana sitting alone on the bench with the romantic Taj Mahal and reflecting pool in the background. Best times to visit are from October to March. For a truly spectacular sight, see the Taj Mahal during sunrise, sunset or at night during a full moon. No. 4 on the list is the Sheikh Zayed Grand Mosque Center, one of Abu Dhabi’s most iconic landmarks. Opened in 2007, the largest mosque in the United Arab Emirates holds up to 40,000 people. With its white marble domes and opulent interior, the Sheikh Zayed Grand Mosque is a masterpiece of design that is not to be missed. The architectural work of art is home to the world’s largest marble mosaic (in the mosque’s courtyard) and the world’s largest carpet (in the main prayer hall). In addition to imported marble, the mosque also features the world’s most valuable European chandeliers and beautiful Iranian carpets. Free guided walk-in tours (45-60 minutes) are available for individuals and groups. Admission is free. Note: There is a dress code for visiting the mosque – long, loose-fitting, ankle length trousers or skirts; women must wear a headscarf. Rounding out the top five is Basilica of the Sagrada Familia, Barcelona’s most famous architectural landmark – and the city’s top tourist attraction. It is Antoni Gaudi’s (Barcelona’s most internationally renowned architect) unfinished masterpiece – construction began in 1882 and it continues today. As spectacular as this cathedral looks during the day, it’s even more stunning at night. The cathedral, a symbol of Barcelona the world over, draws millions of visitors from around the globe every year. At first glance, the towering temple looks similar to an intricate giant sandcastle – what do you think?